Stop polluting Vrbas - The protests from June 2013 after a two week of severe air pollution caused by Vital factory. Since 2004, Vital AD - factory for edible oil and vegetable fats - is in the focus of NGO Ekoloski pokret Vrbas due to the negative effects of its activities on the environment of the town of Vrbas. Vital AD established in 1855 is edible oil and vegetable fats factory located in the town Vrbas on the Great Bačka Canal (Veliki Bački kanal). The Great Bačka Canal flows into the Danube River and is part the old regional water management system for flood protection and irrigation. 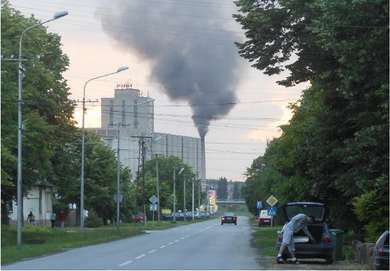 The factory was privatized by the company Invej AD in 2005 and its production increased as well as the amount of pollution due to the lack of investments in clean technology. In 2007, Vital AD got restricted to use of only natural gas as the process fuel. However, instead of natural gas the factory continued using other energy sources such as production waste, sunflower meal and shells, at the same time reducing the costs of proper waste disposal. 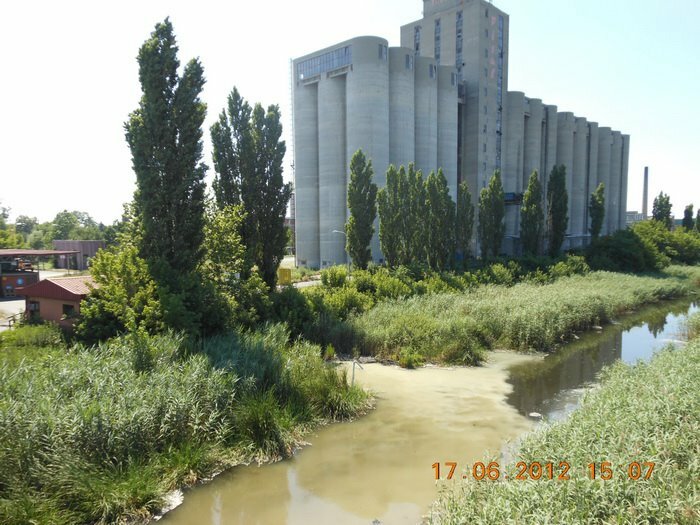 In 2010, Vital AD wastewater treatment capacity was closed and the wastewater was directly emitted into already highly polluted the Great Bačka Canal. Since 2004, local environmental NGO Ekoloski pokret Vrbasa has organized multiple activities to indicate the severe air and water pollution caused by Vital AD. Together with the neighboring community they organized protests and protest walks, a petition, and have reported the case to the water authority “Vojvodina Vode” as well as to the Environmental Inspection at Province and Republic level and the Municipality of Vrbas. Finally, NGO and supporters have sent open letters to the Serbian Ministry of Environment, called the general public to boycott Vital AD products and have criticized the media at the republic level for not covering the case. The national environmental inspection argued that the factory cannot be closed due to its importance for the feasibility of the future central wastewater treatment plant project. A central wastewater treatment plant should encompass the municipal wastewaters of three communities (Vrbas, Crvenka, Kula) and factories that are located on the Great Bačka Canal. Vital AD's wastewaters represent a significant part of necessary volume for proper functioning of the treatment plant. Instead, the national environmental inspection ordered the local environmental inspection to measure the air pollution in town Vrbas, in order to provide evidence based on which the citizens could demand from the Ministry of Health the elaboration of an assessment study of pollution influence on the citizens health in town Vrbas. Even though the inspections have responded to NGO and citizens calls, impacted groups are not satisfied with the results, and consider the case being fixed in an agreement between the authorities and the owner of the factory. The discontent of citizens and NGOs have resulted in a lawsuit against the company. The company has repeatedly rejected to admit pollution from the production, claiming it has been packing the finished products. In August 2013, an NGO reported the case to the Government of the Republic of Serbia and the Anti-Corruption Agency demanding the cancellation of the Vital AD privatization. Also the NGO and communities request the factory to implement pollution abatement technology. In 2013 Vital AD production was reduced due to its bad economic situation; however the company continued polluting by burning the waste from its production. At the beginning of 2014, factory production was re-established thanks to the funds from new partners, however without any investments in environmental technology. In October 2015, NGO Ekoloski pokret Vrbas filled another criminal charge against factory Vital. The authorities suggested that the factory cannot be penalized because of the regulation that gave it time to 2030 to build waste water treatment system. In April 2016, for the first time since start of the conflict, the management of the factory met the representatives of the NGO. However the activists are not convinced in the factory authorities’ intentions to invest in environmental improvements due to its bad economic situation. Project Details Vital AD is producing edible sunflower oil, vegetable fats, ketchup, margarine, mayonnaise, and mustard. Closing the wastewater plant is considered a strategic move to save some 340,000 USD annually year for its maintenance. Hundreds of tonnes of waste water were discharged to the canal so far, 500 to 800 m3 daily. Around 800 people have been fired since the factory was privatized. Approximately 6800 m3 of wastewater per day is directly emitted in the Great Bačka Canal without any treatment. No quantitative data on air emissions. Environmental justice organisations and other supporters Ekoloski pokret Vrbasa http://www.ekovrbas.net/; Primary schools “20th of October” and “Bratstvo i jedinstvo” Vrbas; Association “Beljanska bara” Turija; Ecological Movement of Srbobran; Sports association “Vinogradi”; Sports association “Mladost”; Group of citizens from Kula; and Local television station “Bačka”. Development of Alternatives The activists are requesting implementation of the pollution abatement technology, as well as cancellation of Vital AD privatization contract. Why? Explain briefly. Vital AD continues working without any changes in the production processes. In addition, the factory cannot be penalized because of the bad regulation. As of today, no decisions on the juridical case or the request for privatization repealing have been issued. Protesti ispred Vitala na danu voda 2012. 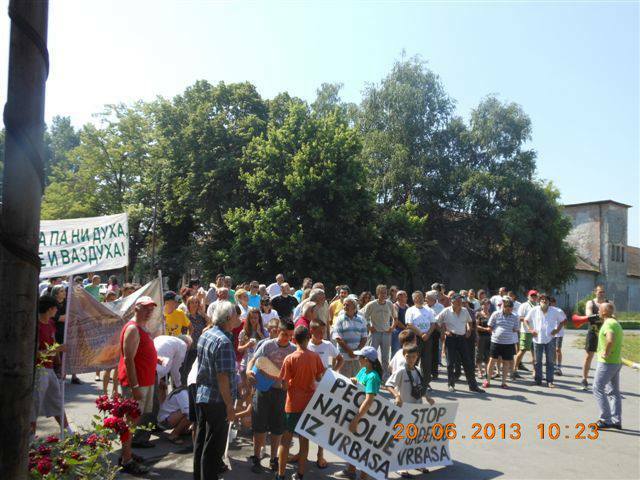 Stop polluting Vrbas The protests from June 2013 after a two week of severe air pollution caused by Vital factory.